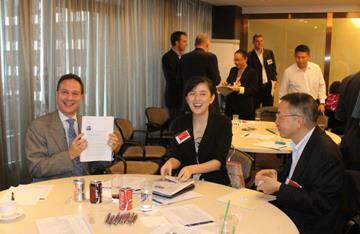 The 4th Annual ATTA Conference was held on 8th and 9th November, 2013, once again at PwC’s office in The Landmark, Hong Kong. With over 50 people attending the Conference and its related events, it was our most successful event ever. All of the feedback not only commented on the quality of the speakers but on the caliber of the delegates and this was highlighted by the discussions held during networking and when questioning the speakers during their sessions. Please click here for photos of the 2013 Conference. The 2013 ATTA Conference began with a lunchtime presentation and discussion, initiated by CV Ramachandran, Managing Director and President, Asia, AlixPartners, who provided a highly insightful summary of projected restructuring trends in the region, by sector and territory and their apparent drivers, from a commissioned survey. The study concluded that one size does not fit all, the majority of restructuring solutions will be operationally focused, rather than pure financial engineering and that there will be growing demand for restructuring related to transformational growth and expansion. The survey highlighted the financial services, manufacturing and telecoms industries. CV deduced that the growing value recognition of a Chief Restructuring Officer (“CRO”) is an immediate growth opportunity for the profession. From the survey of users of CROs, a key point that emerged was that a CRO’s main pre-requisite to being engaged was their experience as someone who has done a restructuring or turnaround before, with industry knowledge a non-essential “nice to have” and language skills only being a minor consideration. This discussion was then was followed by Adam Salzer, Managing Director, PwC Consulting who provided an overview of work and drivers in the business transformation services sector and specifically how cultural change was an essential tool to sustainable organisational transformation. Rupert Purser, Co-Chair of ATTA, provided an overview of the past year and key achievements and challenges of ATTA. Rupert introduced the newly elected Board and provided an outline of the management and organisational structure of ATTA and the key focal areas of the Board, while encouraging all members to provide feedback and to actively participate and contribute. With an example of the recent work undertaken by the International Think Tank, Rupert outlined the Board’s provisional three year plan and immediate focus. The focus for the coming year will be to expand ATTA’s regional and global networks and influence, enhance public relations including amongst users of Transformation & Turnaround professionals, support local chapters in events and local networking, identify how ATTA can provide more value to its members and to generally increase their engagement. A very successful “Hot Dating” session was held where all delegates were systematically circulated around the room to introduce themselves to one another, to enable later follow up during the conference. To support this networking, a delegate’s pack was provided to all participants, which comprised the accumulated bios of all attendees. This flash networking helped break the ice and set the scene for the next speakers, Shane Sibraa, Managing Director, Asia Pacific and Dilal Ranasinghe, Director, from executive search firm, Argyll Scott. 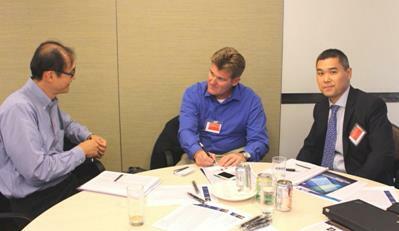 Rupert moderated a structured discussion of how members can best work with head hunters. Shane suggested using head hunters for intelligence and in preparation of targeting clients such as private equity managers (identification of needs and building a deck of management resources, etc.). Shane mentioned web sites, such as www.findthebest.com as a useful tool. Shane and Dilal provided tips on how to best present in a resume, particularly highlighting management of cross-cultural differences. Dilal explained that an appropriate social media presence was critical, as it is heavily used by recruiters and employers. Dilal especially recommended they use LinkedIn to highlight core competencies. Following the social media theme, Alex Berriman, Interactive Media Manager from T8 Consulting, armed with compelling statistics, followed up with a session on the importance and rise of social media and how it can boost business leads, profile and customer centricity. Considering ATTA, he suggested that an investment of 4-6 hours a week on a social media programme would be reasonable, with a focus on two social media platforms, including LinkedIn. A show of hands showed how pervasive social media was amongst the delegates. The second day “kicked off” with Ian Gray of Baronsmead Consulting providing a fascinating insight into the UK soccer world, governance, related media and banking workout approaches, as he shared his experiences in turning around English soccer club Tottenham Hotspur. This was followed by Gary James, CEO, Waterfall Partners, providing a highly practical session on developments and methods for legal currency transfer into and out of China; and tax considerations that need to be taken into account before and when undertaking a transformation or turnaround and how using the correct tax structure can make a significant difference to distributable profits and cash flow. Don Gadsden, Director, PwC Consulting, Rupert Purser, Head of Business Consulting & Risk Advisory, AMEA, Hill International Inc. and Warren Beese, Director, GSE International ran a session providing insights into privately-held and family firms and shared their experiences in being involved in transforming or turning around such companies. One common factor was the need to find out who had real influence for decisions – often not vested with the CEO. Also discussed was the need for proper succession planning and some examples of how this can be managed. Investigating corruption and fraudulent activities, which can often be uncovered only after appointment in a change management role, has been a common topic request from members. Nick Gronow, Senior Managing Director, FTI Consulting shared his experiences of fraud investigation across Asia and provided some practical and insightful tips to identify when initial alarm bells should start ringing when looking at companies and their published information and accounts. The next session looked at how to overcome people and cultural issues. Lesli Ligorner, Partner, Simmons & Simmons looked at the legal aspects involved when undergoing change in human resources from an employment perspective. After lunch, Adam Salzer talked about the cultural challenges involved in a transformation and how these can be managed. James Bristow, CEO, Rotam Agrochemical then shared his recent transformational work about the change they had undergone and the challenges they had faced. Neil McDonald, Partner, Hogan Lovells gave an overview of legal issues to be aware of when looking at a transformation or turnaround in China, particularly when seeking to enforce rights. Apart from issues of government and party relationships, his take away points included taking into account environmental factors, such as pollution and local compliance and also the importance of ensuring that Intellectual Property and related registrations and licensing agreements are as they should be. Ian Gray shared his experiences across Asia and Europe about the maximisation of stakeholder value in a company, with examples and insights into grooming businesses for exit and related challenges. Ian emphasised planning, strategy and stakeholder communications to determine target achievements from the exit, contingency planning and viability. The final session of the Conference saw Simon Yim, Managing Director, LDC (Asia) discuss his experiences in private equity as a deal originator and portfolio manager, with a focus on operations and manufacturing businesses. The delegates then enjoyed the uplifting and philosophical insights of Prof. Dr Richard Hames of The Hames Group as he explored the acts of transformation and turnaround in a wider context and the impact that we can have to affected parties when transforming or turning around a company.